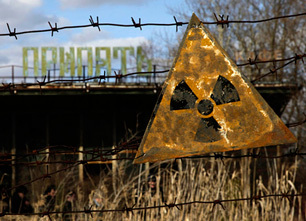 Iodine-131 was a significant hazard of the Chernobyl disaster. Iodine-131 is a radioactive particle produced by the fission of uranium atoms within nuclear reactors. It can also be produced by plutonium and/or uranium in the detonation of nuclear weapons. It takes the solid form of a purplish-blackish crystal and can undergo sublimation, changing from a solid to a gas without first becoming a liquid. It dissolves in water, and can easily be ingested. Iodine-131 can enter the environment through air or water. Because Iodine-131 is created through fission and matures within rods, if the rods are not carefully monitored pressure can increase, leading to corrosion and eventually leakage. It leaks into the cooling liquid surrounding the cracked rod, and circulates throughout the facility. While Iodine-131 tends to attach to organic particles like soil, it can spread fairly quickly through water. The EPA has set limits on the concentration of radioactive iodine and other radionuclides found in drinking water. Long term exposure can cause thyroid cancer. Low doses can decrease the production of hormones in the thyroid gland, and doctors will sometimes use small amounts to detect thyroid problems or to treat patients with overactive thyroids. The EPA recommends reverse osmosis and ion exchange to treat Iodine-131 contaminated water.